We Can Ship ADA Compliant Signs to Your Business! Businesses all across the United States are required to meet the guidelines set out by the Americans with Disabilities Act (ADA). However, many facility managers do not find out about this until they are faced with a lawsuit or fines. And, even then, you might find that there are no sign shops in the area with the experience needed to produce ADA compliant signs. Fortunately, The Sign Studio is here to help you buy ADA compliant signs online. Is Your Organization Required to Have ADA Signs? The only rooms inside of your building that must have ADA signs are the ones that have a permanent purpose. For example, if you have a room that started as a copy room, was converted to a storage closet, and is now a file room, you could probably pass on ADA compliant signage. On the other hand, when you have a conference room that does not change its use over many years, then you will need ADA signs. Also, the ADA does not require you to label individual office cubicles unless the furniture is bolted to the floor. But, we still suggest that you add compliant numerical signs to identify cubicles since it is useful and affordable. Since you will help employees and guests find their way around, it is usually worth the effort to do more than the bare minimum to make your facilities more navigable. If you are in close proximity to The Sign Studio, we can send out a certified access professional to perform a site survey and make recommendations for what signage you need to meet ADA guidelines. It is a little bit trickier for us to make suggestions for our nationwide customers, but we are skilled at looking at floor plans and listening to descriptions of your building and letting you know what markers you probably need. 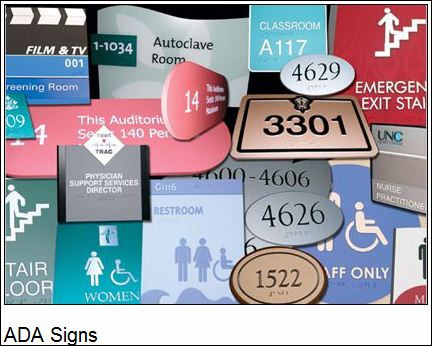 Wherever your building is located, we can ship standard or custom ADA compliant signs. Custom signs are a little bit more expensive, but they are well-worth the price. Why is that? With custom signs, you have the opportunity to incorporate your logo and other branding elements into the marker. This goes a long way in boosting brand awareness as well as lending a level of authority to your signage. 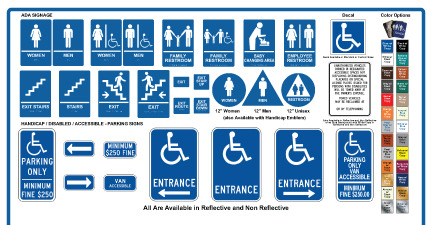 Most of our ADA signs are easy for our clients to install on their own with the kits and instructions we supply. We are also available to provide excellent customer support if you ever have trouble installing your markers. For the more heavy duty jobs, we can mount the ADA markers for you, or we can have one of our many partners across the country help you out. If you are running up close to your grand opening date or need ADA signs in a hurry for any other reason, buy ADA compliant signs online from us and we will quickly ship them to you anywhere in the US. For a free consultation, contact us today.